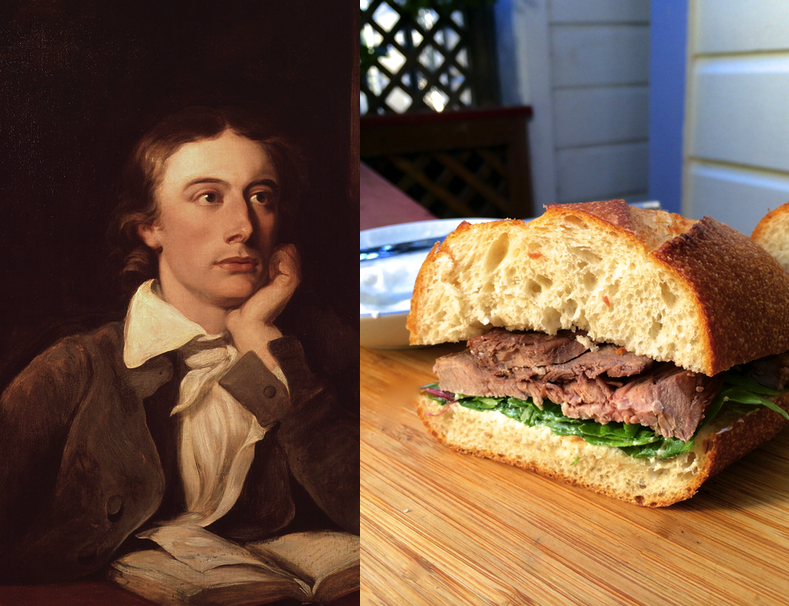 Keats wasn’t alone in his love of roast beef. Maybe the most iconic English meal of the time, it’s the the dish that gave Beefeaters their name; the Tower of London guards were granted the right to eat as much meat as they wanted at supper. The traditional song of the Royal Navy is titled “The Roast Beef of Old England.” Even the French noticed how much their neighbors across the channel revered the roast, referring to them snidely as rosbifs. Roast beef is customarily served as the main event at dinner, but don’t let tradition stop you from eating it any old time. The novelist Walter Scott, a contemporary of Keats’, described cold roast beef as an ideal breakfast dish. But I like it best the same way Keats envisioned: in a sandwich on a summer afternoon (preferably delivered by someone good-looking). “Give me books, French wine, fruit, fine weather and a little music played out of doors by somebody I do not know,” Keats wrote. Add a sandwich, and who could ask for more? 1. Preheat oven to 475°F. Remove beef from fridge and place on a roasting pan. Rub with olive oil, salt and pepper. 2. When oven is ready and beef has rested at room temperature 15 minutes, add to oven and reduce temperature to 400°F. Roast 1 hour, or until done to your preference. Tent with foil and let rest 10 minutes. 3. Meanwhile, in a small bowl, mix together horseradish, garlic and mayonnaise. Season with salt and pepper to taste. 4. Carve thin slices from roast beef. 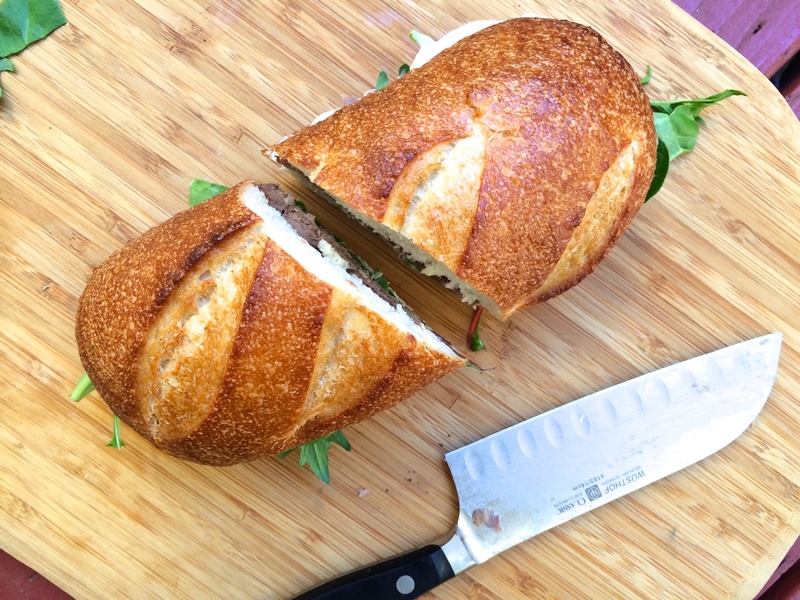 Slice roll in half and spread both cut surfaces with the horseradish dressing. Top with greens and roast beef. Close sandwich. 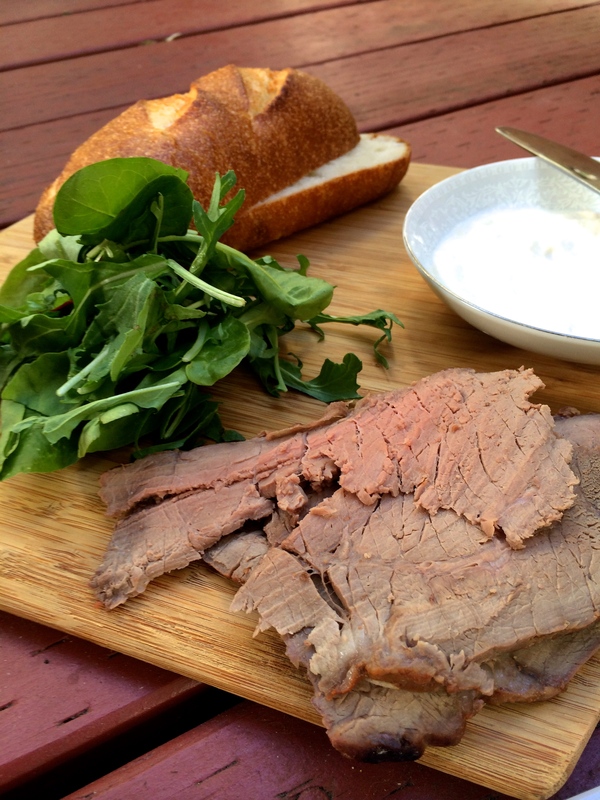 Roast beef (or, hilariously, “French Dip”) sandwiches are the greatest invention ever. I haven’t tried it with horseradish, probably because the first thing that springs to mind is Arby’s “roast beef” with their “horsey” sauce (ergh) but this sounds wonderful. Unfortunately I’m allergic to mayonnaise but a nice white cheese might add a little creaminess to it, like a havarti. Aha! Another one who finds the “horsey” name repugnant! Thought it was just me. Horseradish, putting the Arby’s moniker aside, is a thing of beauty on roast beef sandwiches, and this one looks fabulous. Amazing blog, i will follow you from Italy! Hey Nicole. Lovely blog. I just linked to your blog on a post on my blog on literary meals. Do check it out. Oh wow…Keats sure was a good poet. Poor him, though…having to go through food withdrawals and restrictions while on Tuberculosis… My mom is currently going through the same thing (no regular milk for her… so no Ice Cream unless it’s made without Dairy) after she had a (thankfully rather minor) heart attack (The syptoms for women are way different than men). Have you ever heard of that great movie “Bright Star”? Starring Ben Whishaw? It’s a biopic about Keats and his romance with some girl after he was diagnosed with Tuberculosis. Whishaw was just 28 or 29 when he made that movie. Great movie, by the way. Really well-written. And Hmmm…these sandwiches would be great to bring to a picnic or something, don’t you admit it? I certainly would. Great blog, by the way!